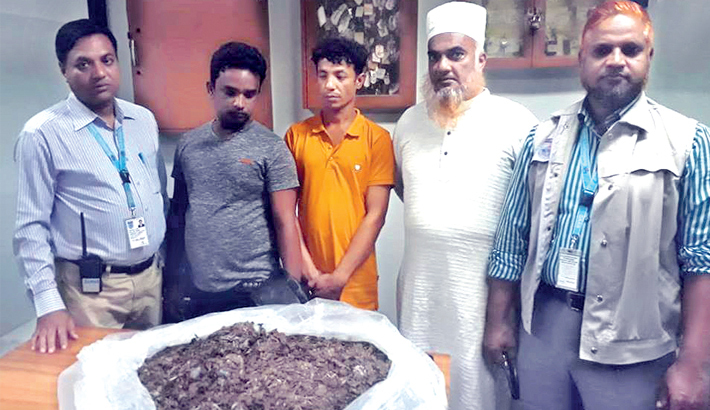 CHATTOGRAM: An air passenger and his associate were arrested with six kilograms of cannabis while smuggling them abroad at Shah Amanat International Airport in the port city on Monday morning. The arrestees were identified as Md Rubel, 25, a resident of Brahmanbaria, and his associate Md Nizam, 32. Sources said Rubel was scheduled to go to Oman after a stopover in Dubai from Chattogram around 11:00 am. Airport Manager Wing Commander Sarwar-E-Jahan said security forces arrested Rubel when presence of the drug cannabis kept tactfully inside mattress was detected during scanning at a gate. His associate Nizam, who reportedly came at the airport to see him off, was also arrested in this connection, he said. Later, some six kg cannabis was recovered from the mattress. In the preliminary interrogation, Rubel admitted that he was carrying the cannabis to Muscat in Oman to sell. The airport manager said it was the first time any attempt of smuggling drug to abroad was detected and foiled. A case was filed accusing the arrestees with the Patenga Police Station in this connection.